At the turn of the 80s, Rush were at a crossroads. They were, as Metallica’s Kirk Hammett later put it, “the high priests of conceptual metal”. But in the wake of punk, in an era dominated by new wave, it was time for Rush to move on. The three members of the band – bassist/vocalist Geddy Lee, guitarist Alex Lifeson and drummer Neil Peart – had felt that they were repeating themselves with their 1978 album Hemispheres. For all the brilliance in that album, it was, as Lee said, “formulaic” – with a 20-minute title track similar to previous epics such as 2112. And so, for a new decade, they developed a new sound. The reinvention of Rush began with the hit single The Spirit Of Radio and the album Permanent Waves, released in January 1980. A year later, the band had the biggest selling record of their career with Moving Pictures. But with success, and progress, came tension. Neil Peart’s discomfort with fame was expressed in the 1981 song Limelight. And on 1985’s Power Windows – an album dominated by keyboards – Alex Lifeson would find himself marginalized. Geddy Lee: I can’t say that punk rock had directly influenced us. But there was a change in music at that time in the late 70s. It was an exciting time, musically, a lot of change in the air. And we wanted to change too. Alex Lifeson: There had been a shift from the last vestiges of the rock scene of the early 70s to the punk movement. And by 1979, when we started working on Permanent Waves, I think we were more aware of what was happening in music. We were not so much in our own little world. Geddy Lee: You’d turn on the radio and you’d hear all kinds of interesting rhythms, some of those great rhythms that Stewart Copeland was doing with The Police. I remember a lot of ska and reggae bands were huge. We were listening to lots of different stuff, and that eventually soaks through into what we do. It’s just the natural way. We soak it up like a sponge and see what we can use. Alex Lifeson: We were going in a different direction. And we were starting to write in shorter, more economical and concise forms. Geddy Lee: The idea of approaching another twenty-minute opus just seemed very un-enticing, and repetitive. It was like, okay, we need to stay fresh and change the way we do things. So it seemed like a good challenge to see if we could take some of the elements that we would have liberty with over a ten or twenty minute period and try to condense those into seven or eight minutes. And back then, that was short by our standards. Alex Lifeson: It was time to try something a little different. The idea was to make shorter but still very complex songs. Geddy Lee: Let’s try something in seven minutes! It’s still long enough. We can jam a lot in seven minutes. And we could have a song deliver more – in terms of climax – in a shorter period of time. We could still tell a story in a song, but without hitting you over the head with it. And in terms of overall concept, we could also make the threads that connect each song a little more subtle. We were looking for more diversity. Alex Lifeson: We still had a couple of long things for Permanent Waves. There was Natural Science, a very ambitious song, and Jacob’s Ladder. But we also had The Spirit Of Radio, Freewill and Entre Nous – shorter, punchier songs. Geddy Lee: The Spirit Of Radio was written pretty early on. And that was the song that sparked most of that album from that point of view. We were able to throw a lot of different things into that song, in five minutes, and it worked. Geddy Lee: Music was changing, and radio was changing. Our access to great music – the way we were getting it on FM radio, for example – was dying and becoming more commercialised. The Spirit Of Radio carries that feeling, and I think that people related to that song because of the way the music industry was going. It wasn’t about love and getting laid, the typical rock stuff. So it was fresh. And there’s a very positive sound to that song as well. There’s a life to it. Alex Lifeson: The opening riff in that song was based on the movement of radio waves. At least that was the idea! Geddy Lee: The way that song changes from one style of music to another is to replicate an FM dial turning. Maybe it was too subtle. It makes me wonder if we should have been more obvious about it. Alex’s riff set the tone for that song. And while that riff was steadily blasting through, Neil (Peart) and I wrote these counterpoint punctuations all around it, started playing with the time signatures. We thought it was quite innovative. We recorded it live, using a sequencer, which in those days you had to manually program with switches, to get it to work that one time. So you couldn’t screw up. Alex Lifeson: We recorded Permanent Waves in Canada, after two albums that were made at Rockfield in Wales. So that was another shift – being back home again. It was inspiring. Geddy Lee: It was the first time we recorded at Le Studio in Morin Heights, Quebec – this beautiful mountain retreat. We recorded in this room that had giant picture windows. After recording all those years in bunkers, it was such a refreshing change. And I think that contributed to the ‘up vibe of that whole record. That album came together really quickly, and to this day it’s one of the most pleasurable recording sessions we’ve ever had. We knocked it off in five or six weeks and that was it. Done. Alex Lifeson: We felt that we’d really achieved something with that record. The songs were shorter, but still challenging for us as musicians. And even now, when we do The Spirit Of Radio live, it’s still hard to play well. Geddy Lee: Natural Science is like that too – not easy to play, but really fun. We played it on the last tour, in 2015, and it still remains one of my favourite songs to play live. We didn’t do it every night on that tour, but when we did play it, it was always a highlight for me. It’s one of those songs that has improved with time. On record, parts of it seem a bit stilted to me. But now, when we play it live – with decades of improvement in our technical ability – that allows us to give that song its full power. Alex Lifeson: The big thing about Permanent Waves was that the band changed – we moved forward. In that sense, it was really a big record for us. Geddy Lee: We had such a great time making Permanent Waves, but Moving Pictures was a much more intense experience. It took quite a bit longer to make that record. For sure, it was not as easy as we would have liked. Alex Lifeson: It’s always hard to make records. It’s always an enormous drain emotionally. Geddy Lee: We went back to Le Studio for Moving Pictures. It was the dead of winter. We also had a lot of technical problems. There was a lot of experimenting to get the right sounds. Alex Lifeson: Most of that record was written by all of us at the same time, in the room jamming with an idea and everybody going from there. What we ended up with was, I think, some of the strongest and most enduring material that we’ve ever written. There are a lot of songs on that record that reached a really high standard. Geddy Lee: Everybody points at Tom Sawyer as the big song on Moving Pictures, but Red Barchetta was such a pivotal song on that record. Red Barchetta came pretty easy and got us rolling. Tom Sawyer was the complete opposite. Alex Lifeson: Tom Sawyer was such a hard song to get right. At one point we weren’t sure that we were even going to be able to make it work. Geddy Lee: The hardest thing of all was getting the right guitar sound in the solo section. We wanted that section to be played pretty much as a three-piece, not a whole lot of overdubs, but with a sound that filled up the stereo spectrum and didn’t sound empty. So the guitar sound for Alex’s solo was really critical. It wasn’t drowning in echo. That was the old trick we used in the past. If you want to fill the space, put an Echoplex on Alex and the repeats will fill up the space. But we didn’t want to do that. We were going for this dry sound with that unique tone, and for it not to feel empty, that was kind of hard. Geddy Lee: At one point I said, ‘‘We always have one song, on every album, that doesn’t quite click.’ And we thought that Tom Sawyer was going to be the one. Which just goes to show you we don’t know what we’re talking about! Alex Lifeson: When we finally nailed it, we were so happy. Geddy Lee: There were other songs that came together more easily. YYZ was one. Neil and I wrote it one day when, for some reason, Alex wasn’t around. Neil and I just went out to the barn at Le Studio, where the gear was set up, and we started putting YYZ together as a bass and drum jam song. Then Al came in and added his licks, and before you know it the song was finished. Alex Lifeson: Another song that happened pretty fast was Limelight. It’s really just a straight-up rock song. Geddy Lee: When Neil wrote the lyric for Limelight, it was at a time when the band was becoming more popular. It was a different level of fame, and Neil was being confronted with things on a regular basis that were making him really uncomfortable. So he wrote that lyric: ‘I can’t pretend a stranger is a long awaited friend.’ That song was Neil’s way of trying to sort it out. Alex Lifeson: There’s one song that’s really kind of an oddball – Witch Hunt. But it’s good – very dynamic. Geddy Lee: Witch Hunt was an attempt at being cinematic, boldly illustrating a theme. It was fun to do that. Alex Lifeson: The last thing we wrote for the album was Vital Signs. We needed one more song, and we wrote and recorded Vital Signs in one day. It was one of those happy, spontaneous things. Geddy Lee: We felt that we needed something really different to the rest of that record – something that was up-tempo and that had a more modern pop/rock vibe to it. Alex Lifeson: Vital Signs ended up being the last track on the album. You’d think, looking at the songs, that something big like The Camera Eye would be the closer. But we went out on a different note with Vital Signs. It was an interesting way to finish off the record. 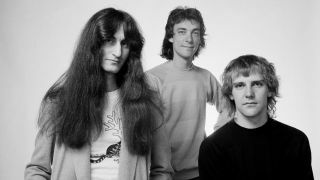 Geddy Lee: Moving Pictures became the biggest record of our career, but at the end of the sessions I was so burnt out I really didn’t know what to think of the record. It took us so long to finish it that by the time we left Le Studio it was late December, and I had stupidly taken my new sports car up there. It was one of the first sports cars I’d ever bought, and I had to drive it all the way home to Toronto through this horrible snowstorm, with our producer Terry Brown following in his car with his dog Daisy. When I got to Toronto I went straight to the airport, without sleep, and got on a flight to the Caribbean, where my wife was waiting for me. That first night on our holiday, I listened to the record it sounded all wrong. It took me a good couple of weeks before I could listen to it again and go, okay, it sounds pretty good! Alex Lifeson: The songs were good. They connected with a bigger audience. But there was also something about the sound of that record that resonated with people. Moving Pictures was very successful. It’s no exaggeration to say that this record changed our lives. Geddy Lee: The Signals album was a turning point for the band. It was the beginning of our ‘keyboard era’. We had used synthesisers since way back, but on Signals that really came to the forefront. Alex Lifeson: At first, I was totally into it. I even played some keyboards. I thought it was a really important and unique part of what Rush was becoming. Geddy Lee: Signals was a good record, but after that there was another big change. We decided to go with a new producer. We didn’t want to go back to Terry Brown. We didn’t think that was the right thing to do. We were set on moving forward. Alex Lifeson: We met with Steve Lillywhite in London when we were on tour, and we seemed to be set with him. Geddy Lee: We thought the music that Steve was working on was pretty cool. I remember the Big Country record he’d just done, The Crossing. I loved the way the guitars sounded on that record – they had an attitude. We were thinking of doing a more guitar-driven record at that time, and we thought that Steve would give us a fresh approach because he was kind of a hip guy. It would be a new approach to a guitar-based record, and he would give us a fresh look at the keyboards too. We were just hungry to learn. Alex Lifeson: Then, right at the last moment, Steve pulled out. He went off to work with Simple Minds. Geddy Lee: That was tough. I still have great respect for Steve as a producer, but at the time we were very frustrated and disappointed. Alex Lifeson: We ended up co-producing the Grace Under Pressure album with Peter Henderson. So we were working a lot more on that record. We were the studio for months during a very cold, snowy winter in Quebec. But in the end, there’s something about the sound and the power and the quality of the songwriting that really strikes me. I really love that record. Geddy Lee: My love of keyboards – I guess you could call it an obsession – reached its peak on Power Windows. Geddy Lee: We would get caught up in the making of an album, and then maybe after it was done Alex would hear it with fresh ears, he’d be like, ‘Hmm, maybe that was too much keyboards.’ Every so often it would come up in conversation between us. Alex Lifeson: I did see the bigger picture: I knew we were going in a new direction and this was part of it. I don’t have anything against keyboards. Geddy Lee: Power Windows was very much an album that was out of that whole Trevor Horn school. We brought in this synthesiser guy, Andy Richards, who really brought it up a notch in terms of quality and technology. This was very attractive to me, because it was new and fresh and exciting. Alex Lifeson: For me, that record was a challenge. But I thought: go with it and it will all work out in the end. So I did that. I just saw that there was a shift in my role. Geddy Lee: When you’re using that many keyboards, you’re taking up so much space on the record. Then the guitar has to fit around that. With a lot of the songs on Power Windows – songs like Grand Designs and Marathon – we had so many parts already done on keyboards that on previous records the guitar would have filled. So Alex had to figure out a way in. That’s really what it required of him. Alex Lifeson: The guitar suffered in a lot of the mixes. That’s what bothered me more than anything. The bottom line was, I just thought that we needed to preserve the core of what the band is. It’s a three-piece.